One of my favorite comfort foods is fried chicken. 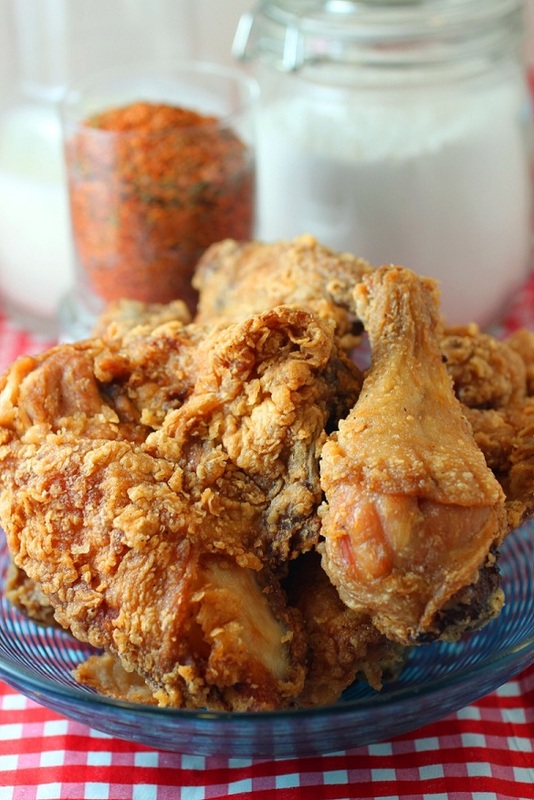 The best fried chicken is one that is not oily, has great flavor throughout the chicken, is very moist, and has soft but crunchy skin. Although there are many good recipes available, I think you will really like mine. My secret is a dry brine followed by an overnight soak in buttermilk which tenderizes the chicken to create very moist and flavorful chicken. The soak also softens the skin and the finishing touch of adding baking powder to the flour mixture makes the skin nice and crispy. Another secret is to let the chicken dry out for 10 minutes after coating it with flour and then re-coating. A cast iron pan is the best choice as it heats very evenly and maintains the heat better than an aluminum or steel pan. I use lard for my fried chicken. Yes, it’s better to use the real thing as nothing matches its savory richness and earthy flavor. This is the only way to get the authentic Southern flavor. Once you taste it, you’ll know what I mean. Cut whole chicken in half and cut into 12 pieces. I like small pieces as they cook faster: 2 wings, 2 drumettes, 2 thighs, 2 drums, 2 breasts cut in half (4 pieces of breasts). Cut out the backbone and save for soup stock. Pat dry. Sprinkle a medium coating of SYD rub on all sides. Sprinkle cayenne pepper if you like your chicken spicy. Place seasoned chicken into a shallow rectangular dish and put the dish in the fridge for 1 hour to allow the dry brine process to take effect. You will know the chicken is ready for the next step when you see that the rub has been absorbed by the chicken and it takes on a tacky consistency on the surface. Once the chicken looks tacky, pour enough buttermilk to completely cover the chicken (about ½ qt). Cover with clear wrap and let rest overnight in the fridge. When you’re ready to cook the chicken, mix 2 cups of flour with 1 tablespoon of baking powder and 2 tablespoons of SYD Competition Meat Rub. Drain chicken in a colander for 10 minutes. Dredge chicken in seasoned flour mixture. Let rest on wire rack for 10 minutes to dry out and then recoat. Shake off excess flour. Preheat your cast iron pan with 4 cups of lard; or 4 cups canola oil. Fry the chicken pieces in medium-hot 360 degree lard in small batches taking care not to crowd the chicken. Turn over once one side is brown. The pieces should be done in 7-15 minutes depending on the size of the pieces and the quantity you have in the pan (e.g., the wings cook the fastest). Use an instant read thermometer to ensure the meat center is over 165 degrees. Repeat for remaining pieces. Chicken is done when the juices run clear when pierced with the tip of a knife. Drain chicken thoroughly on paper towels, sprinkle some finishing SYD rub, and serve right away. Hello, I’m just finding your recipe. I have to admit your fried chicken looks soooooo delish. Better than mine. I would love to make it for my family. Unfortunately, I’m able to purchase SYD, but I can make the substitution you have provided. Could answer a couple of ?’s for me? Once I season the chicken with the rub, should I place it in the fridge covered or uncovered? Can I use the homemade version of buttermilk, while milk and vinegar? Or buttermilk powder? And can I use regular vegetable oil? Yes, you can use a homemade version. I’ve not used buttermilk powder before. Yes, regular veg oil is fine. Any not-so-spicy chili powder would work. You just adjust the spiciness to your liking. Oh thank you so much sir!